The 12-starred blue flag of the European Union will soon flutter more confidently over the soil of Turkmenistan. Explaining EU plans to upgrade its liaison office in Ashgabat to a permanent mission next year, European Commission High Representative for Foreign Affairs Federica Mogherini averred that Turkmenistan is looking for a "reliable partner for reforms [and] modernization." "The decision reflects the EU's wish to fully engage with Turkmenistan in areas of strategic interest such as security, human rights, energy, climate, and the rule of law," Mogherini's office said in a statement. Note that energy is thrown into the mix en passant, as though that were not the overriding matter of importance. Ashgabat-based website Orient News was less coy. In its explainer on the state of European engagement with Turkmenistan, Orient noted drily that no Turkmen gas has been shipped to Europe since 2016 when Russia discontinued use of the Central Asia-Center Pipeline. An alternative would be the fabled Trans-Caspian Pipeline, of course. The EU is exploring all this quietly but with apparent determined intent. A technical and economic assessment now underway is designed to work out pertinent engineering issues and how much the pipeline would cost to complete. That study is slated for completion by March. Even when the financing and engineering hurdles are overcome, there is the political and diplomatic matter to handle. For the Trans-Caspian pipeline to happen, Azerbaijan will need to play ball. As it happens, Azerbaijan's President Ilham Aliyev paid an official visit to Turkmenistan on November 21-22. Turkmenistan and Azerbaijan have been engaged in Turkey-brokered negotiations on a putative agreement on the transportation of gas to Europe since 2015. But there are sticking points, most notably the still-unsettled underwater border between the two nations. Given that the Caspian seabed is a patchwork of rich hydrocarbon reserves, this is not a straightforward matter. Aliyev's tête-à-tête with his Turkmen counterpart Gurbanguly Berdymukhamedov did not produce any breakthroughs that were made public. Nonetheless, state media reported in its usual glowing terms on the signing of 21 agreements on bilateral cooperation, including one on trans-Caspian shipping. A joint statement called for further work on delimitation of the seabed but made no reference to pipelines. Orient published an article citing Azeri political analyst Rasim Musabekov as suggesting the Trans-Caspian Pipeline was almost certainly discussed. But Orient had to acknowledge ruefully that energy issues were "not as topical as transport and transit issues." It is telling that Orient appears to have lifted Musabekov's remarks without attribution from an article on Moscow-based news website Moskva-Baku. The outlet did not see fit, however, to also purloin insight in the same piece from Russian Academy of Sciences researcher Alexander Karavayev, who pooh-poohed the prospects of the Trans-Caspian Pipeline. Karavayev instead argued that Gazprom, which recently announced its intention to resume Turkmen gas purchases, would be in a better position to supply that Central Asian fuel to Europe. According to Karavayev, this would be done by shipping Turkmen gas to Turkey through the TurkStream pipeline now being built across the Black Sea, and from there to Europe. As it happens, on November 19 Russian President Vladimir Putin was in Istanbul to attend a ceremony alongside Turkish President Recep Tayyip Erdoğan to mark completion of the offshore section of that route. As Erdoğan stated at the ceremony, around half of the 31.5 billion cubic meters of gas pumped into TurkStream will be earmarked for European markets. The pipeline is slated for completion by the end of 2019. Turning to an energy transportation project on Turkmenistan's eastern flank, state media reported something looking like progress on the Turkmenistan-Afghanistan-Pakistan-India, or TAPI, pipeline. State-run Turkmengaz, which is leading the project, is taking receipt of $40 million worth of steel pipes from Saudi Arabia's Global Pipe Company. Financing for the 35 kilometers of pipe were reportedly provided by the Saudi Fund for Development. These energy initiatives are all-important because other sectors of the economy are constrained by Ashgabat's utter disdain for basic freedoms. U.S. Customs and Border Protection dealt Turkmenistan a rough blow in May by declaring a ban on all cotton imports from the country under legislation banning goods made with forced labor. The ban also extended to products made with cotton originating in Turkmenistan. In what looks like an attempt to duck this prohibition, Berdymukhamedov ordered, during a November 23 Cabinet meeting, that all cotton fiber be processed domestically. It is not clear how that would avoid the problem. Turkmenistan is evidently feeling the heat from escalating international campaigns for manufacturers to bar use of its cotton. Swedish retailer H&M pledged to stop using Turkmen cotton in February 2016. As of last month, it had been joined by other major apparel producers and retailers like Nike, Gap, Adidas and Marks & Spencer, among others. Foreign engagement is looking grim even in traditionally friendly corners. On November 23, Belarusian President Alexander Lukashenko acknowledged directly, for the first time, that Turkmenistan was behind on payments for construction of the Garlyk potash processing plant. Minsk-based Belgorkhimprom was contracted to build the plant, which was inaugurated to smiles all around in March, but the experience has proven an unhappy one. Berdymukhamedov grumbled earlier this month that output at Garlyk has fallen catastrophically short of expectations, a fact he has blamed on the Belarusians. He then ordered his government to file arbitration proceedings against Belgorkhimprom. Turkmenistan has a startlingly long record of failing to pay contractors, so it feels as though Berdymukhamedov is being led astray by officials scrambling to evade blame. If nothing else, Turkmenistan is becoming quite seasoned in the field of international arbitrations. Russia's RAPSI news agency, which focuses on legal proceedings, reported on November 23 that arbitrators have been selected in the proceedings filed against the Turkmen government by Moscow-based telecommunications giant MTS. The company is pursuing $750 million in compensation at the International Center for the Settlement of Investment Disputes after it was unceremoniously hounded out of the country last year. Away from the high drama of pipeline diplomacy and legal disputes, the population in Turkmenistan trudges on in its desperate bid to eke out an existence. 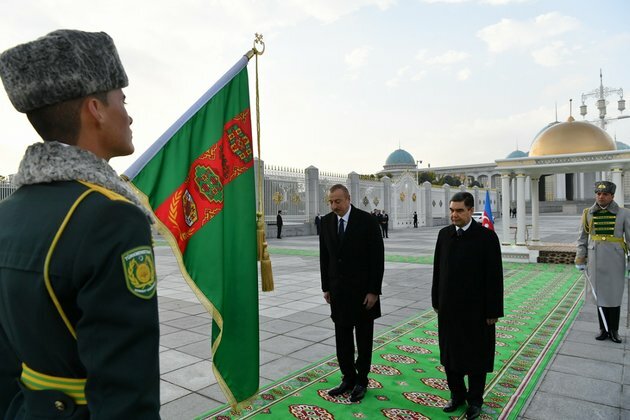 Websites like the Vienna-based Chronicles of Turkmenistan and the Netherlands-based Alternative News of Turkmenistan, or ANT, attempt to peek behind the ceaseless whitewashing by state media. This kind of reporting is done at high cost. Reporters working for these outlets are routinely harassed and even jailed. And government attempts to counter independent media may even be getting more sophisticated. ANT said on November 22 that after it published an article revealing more aspects of soaring poverty rates in Ashgabat, its website endured a welter of cyberattacks.